The Red Cardinal is a popular bird amongst bird lovers young and old. The bright red plumage of the male makes it easy to identify, but humans are the reason we are seeing them at all in New England. The Red Cardinal, or to give it is proper common name, the Northern Cardinal, was named after Roman Catholic cardinals. The ceremonial scarlet robes and high pointed hats of the clergy, resemble both the bird’s rose-red plumage and the crests of adult cardinals. 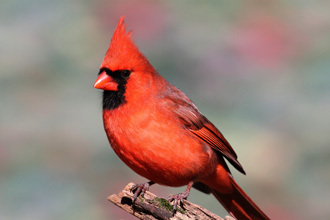 In case you don’t at first see the connection, the point is driven home by the Red Cardinal’s Latin name - Cardinalis cardinalis. It is a mid-sized bird, approximately eight to nine inches long, with a wingspan of ten to twelve inches. While males feathers are very distinctive, the females are a less obtrusive tan-gray color with some red plumage. 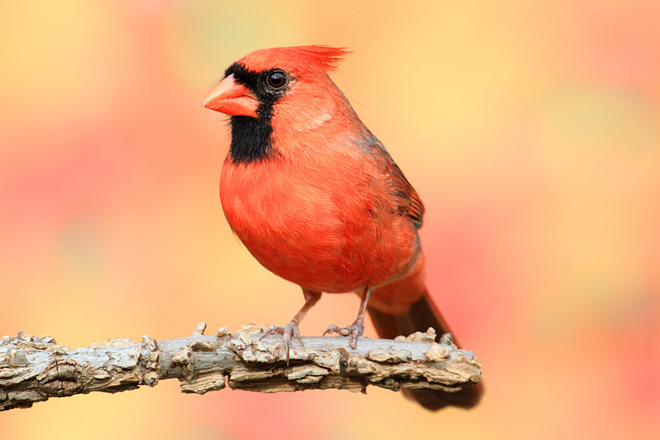 The Red Cardinal is the official bird of no fewer than seven U.S. states: Illinois, Indiana, Kentucky, North Carolina, Ohio, Virginia and West Virginia. These states were part of its typical range, but over recent decades, the Red Cardinal has expanded north into New England. They don’t migrate, and so need to be able to survive the colder North Eastern winters and humans have provided the means for them to do so. They are particularly partial to sunflower seeds and the proliferation of bird-feeders has enabled them to forage all year round in New England. In addition to food provided by humans, they also eat insects, seeds, grain, fruit, and sap. The Red Cardinal can withstand icy winds by fluffing their feathers which traps air, increasing insulation. They can also increase their metabolic rate and reduce water expenditure. 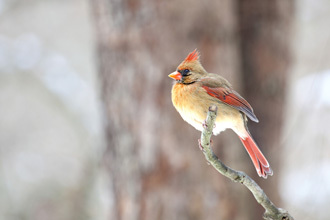 Cardinals are social and join flocks, sometimes with other songbirds, during the winter and fall. When traveling in flocks they tend to eat at dawn and dusk, when they are less visible to predators, particularly when the ground is covered with snow. During mating season in spring and summer, the flocks dissipate as the cardinals pair up. The birds have elaborate mating rituals and the displays are fascinating to observe. At the early stages of a relationship a male will twist and turn towards his prospective mate, showing his breast and spreading his wings, while singing to her. A pair work together to select a nest site. Many nests are found close to human dwellings in forsythia bushes or honeysuckle for example. 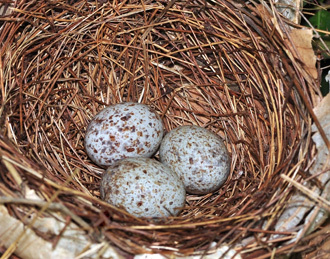 Other nesting sites include hawthorn bushes, dogwood and elderberry bushes. The mated pair raise two to three broods a season, but the eggs or the hatchlings are prone to a variety of predators from chipmunks, squirrels and blue jays, to careless humans who prune a plant too vigorously. The adults fall prey mostly to Cooper’s hawks and some owls. During mating season, males aggressively defend their territory, frequently attacking other males who intrude. This can sometimes lead Red Cardinals to fly into glass windows, believing their own reflection to be an intruding rival. Females chase away other females who fly too close to their nest. These tendencies lessen after mating season allowing the winter flocks to form. Cardinals are active songbirds and sing a variety of different melodies. You can hear one of their distinctive songs here.